I have been waging a highly unsuccessful campaign on Twitter to get drinkers to make 2018 the year when smoke beers overtake New England IPAs as the trendy, hip brew. OK, by "campaign" I really mean putting "#SmokeIsTheNewHaze" in the odd tweet but I labor on nonetheless. This is an old review which I am only now finishing but it fits my tilting at windmills Twitter endeavor nicely. It was a sad day when I noticed Schell's Chimney Sweep was no longer gracing store shelves. Being a rauch dunkel, it was one of my favorite biers combining two of the best flavors: dark and smoked malts. A quick check of Schell's website confirmed my worst fears – it had been retired. Having a rauch dunkel at my disposal for a good chunk of the year was such a blessing but the ride was over. 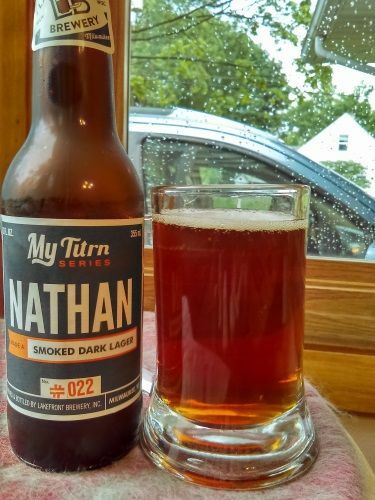 Thankfully Lakefront stepped in to fill the void, albeit for a short time, with Nathan, a smoked dark lager that was the 22nd entry in their limited My Turn series which features styles chosen by employees of the esteemed Milwaukee brewery. Lakefront was founded in 1987 making it one of the oldest microbreweries in Wisconsin. Indeed, it's one of the godfathers of the American microbrew scene. They offer a great brewery tour and brew a wide variety of beers. They've been tweaking their offerings as of late, though, with a distinct turn towards the hoppy. Not being a hophead, I haven't sampled their plethora of lupulin-heavy ales (including a Single Hop series which consists of nothing but IPAs and a Double IPA series) and I miss Cherry Lager. But there's always Riverwest Stein, a fixture at the High Noon Saloon, a new German pils, and My Turn produces something appealing relatively frequently. And so I was quite happy to see Nathan on the shelf. Dunkels are something of a rarity themselves and a rauch dunkel trebly so. Considering the brewery's track record with lagers and rauchbiers I was expecting a fine brew. It poured a dark amber and was unfashionably clear. The small tan head proved short-lived but I spied many a bubble inside the glass. That precious smoky scent caught my nose immediately and my notes say it was of that classic German beechwood variety but I cannot recall if that was my amateur rauchbier opinion, it was noted on the label, or if I had actually asked the brewery. For some reason I suspect I availed myself of the Twitters and asked. Beneath, between, and behind the beechwood goodness was a wee bit of grassy hop as well as a hint of doughy, sweet malt. The proof of the bier is in the drinking, though. A nice slab of smoke pleased my palate immensely. Not so much of a bacon taste as it was, well, smoke. There was also a tasty mild bit of stone fruit malty sweetness balanced by some spicy hops. A generous dose of fizz kept the malty milieu from whelming my tongue. Nathan's body (ahem) was medium-light which made the beer go down easily in the hot summer months. The smoke lingered on the finish and the hops became more prominent which made for a fairly dry, clean denouement. My glass was left with no Schaumhaftvermoegen as it has slid down into the bier. My notes say "Good'n'smoky" and indeed it was. Lakefront certainly delivered as I expected them to. Rather than blather on about how much I loved the smoke taste, I shall instead add that I appreciated the bier's qualities which made it a delightful seasonal: the lightish body, the fizz, and the hops which added some balance to the malt. Nathan proved to be a fine brew both for the cool spring as well as the heat of early summer. The smoke provided a heartiness which went well as I waited for the aestival weather while the body and the fizz made Nathan equally drinkable as the summer kicked in. I am sorry that this brew is no longer with us. R.I.P. Nathan. Junk food pairing: I paired Nathan with Bacon Habanero Pretzel Crisps and didn't spare the horseradish dip.